← 318 "The Fat and the Furriest"
The Family slide down the Batpole into the Batcave. "40 years old and single is not funny"
"Today I Am a Clown" is the sixth episode of the season 15. The episode originally aired on December 7, 2003. "When Krusty admits he never had a Bar Mitzvah, he turns to his father, Rabbi Krustofsky, for help. Later, Krusty realizes his shooting schedule has him working on the Sabbath and proposes to hire a guest host. Not wanting to hire anyone who will upstage him or threaten his career, Krusty hires Homer. On his first show, Homer and his guests Lenny, Moe, and Carl win over the audience by talking about everyday subjects like donuts. Meanwhile, Krusty holds his Bar Mitvah at the Isotope Stadium and invites Mr. T to read from the Torah." Maggie is locked in the bathroom and she is eventually freed, thanks to Lisa trying their rescue solution a second time, after Homer fails. The family hears the doorbell, finding Dr. Hibbert, who says Santa's Little Helper impregnated his poodle, Rosa Barks. He turns over the puppies to the Simpson family and makes them their problem. Although Lisa reads a Simpsons episode guide which says Homer was taking Santa's Little Helper to have him neutered, Homer was never able to complete the deed. Bart and Lisa give out puppies to people, including Krusty, who takes him for a walk to his old neighborhood. However, when Krusty returns to his old neighborhood in the Jewish section of Springfield, he sees the Jewish Walk of Fame and finds his star is not on the sidewalk. He goes to register for it and is told he does not have a star because he did not have a bar mitzvah, which means he is not a Jewish man, so he claims he can not be a "self-hating Jew" but instead he is an antisemite (much to the delight of Rainier Wolfcastle). Bart and Lisa take Krusty to see his father, who claimed Krusty was not given a bar mitzvah, due to his non-serious attitude growing up making him fear Krusty would make fun of the event. He agrees to help Krusty achieve his goal, teaching Krusty all of the goals associated with Judaism. With this happening, Krusty can't do shows on Sunday (the Sabbath); therefore, he must seek a replacement, and gets Homer to replace him for the day. Homer's replacement show is a talk show, featuring Moe, Lenny (later replaced by Barney, Disco Stu), and Carl as panelists. The show becomes a success in its own right; meanwhile, Krusty continues to learn his Jewish traditions. Homer's show is a surprising success, so much, Krusty's show is eventually cancelled by Channel 6. Lisa suggests Homer put his power to good use after listening to Lisa's advice, but ironically, because it comes of as being whiny ratings decline and Homer's show is also cancelled. Krusty, after being fired by Channel 6, pitches his bar mitzvah to the Fox network (knowing "you guys are known for taking chances on crap"). When his bar mitzvah ("Krusty the Klown's Wet 'n' Wild Bar Mitzvah"), featuring Mr. T as a guest, airs, it becomes a ratings smash, drawing "Raymond rerun good" ratings, but the spectacle disappoints his father. Krusty, feeling remorse, claims he wants to have a real bar mitzvah the traditional way at the temple. 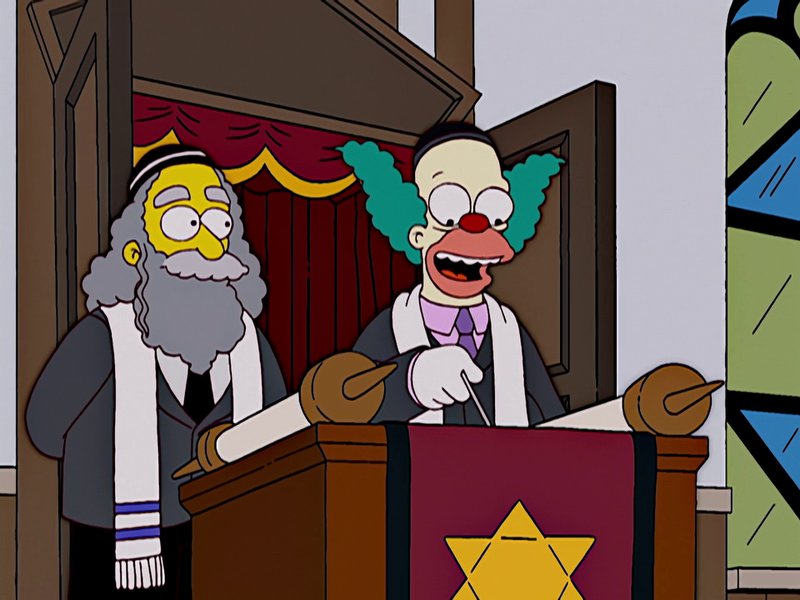 The show closes out with Krusty having an (almost) serious bar mitzvah in a synagogue. 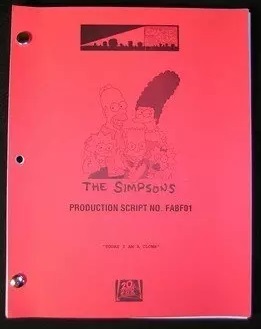 It is a happy ending for everybody, except the Simpsons, who are cancelled when Homer strangles Bart, with their car being thrown in the trash (to be shredded). Modified on June 16, 2017, at 14:15.